It’s been almost 8 months since we left our home in Nashville, TN and crossed the United States to enter Mexico via Tecate on the Baja Peninsula. We have now made our way across the entire country, are a couple of weeks from our second border crossing into Belize and its gotten me thinking about how different daily life is now than it was this time last year – not to mention how much we have learned about ourselves as individuals and as a couple. We left successful careers, our cozy East Nashville home, our friends, family, the security of medical insurance, the comforts of on command air conditioning and the ease of living in a place where everyone speaks your language, literally and figuratively. Our daily existence was pretty normal. Our life now resembles nothing of what it did just a few short months ago. We have learned a lot, we have adjusted a lot, we have come to accept a very different version of normal. The first, and maybe hardest lesson: Not everything changes. Just because you leave your life behind and hit the road doesn’t mean all of your problems or responsibilities disappear. At first glance, from postings of photographs and route maps and updates filled with tequila toasts and playtime with monkeys, this may seem to be a carefree way of living. Sometimes, yes, it is. Actually, more and more. But our previous lives still creep in. You don’t entirely stop being who you were – if you were someone who worried about the future before, you will still worry about the future. Thoughts such as “We left EVERYTHING.” “We sold EVERYTHING.” “We might have NOTHING in about about a year,” will still creep in just as you are watching a glittering lightshow of shooting starts from inside your rooftop tent under a perfect sky. Unless you hit the lottery to do this or sold some million-dollar app, you will still have bills and debts from your previous life. Leaving on an epic journey across 23 countries doesn’t stop your responsibilities; it doesn’t stop your need for things like car insurance or cell phone bills. These things DO get better, because out of an increasing need for freedom, you face and manage more of them and you rack up far less but they don't magically disappear. There will still be the daily tasks of life – laundry, dishes, car maintenance, grocery shopping and errands to run. Only now, each of those tasks will take an entire day or longer because you don’t know the language well, you don’t know the landscape, you don’t know the town. Ever. You will be brand new in every place you are, every single time you need to accomplish anything. These things also take on new meaning and value, you will do dishes under a waterfall or with ocean water. You will take your laundry to a local woman who needs the work to feed her family, you will try new foods and ways of preparing dishes. Errands will become new friendships, funny exchanges and stories to tell. You won’t stop loving and missing your family and friends. Doing something like this doesn’t change the fact that your family needs you. It doesn’t stop your grandfather from slipping into dementia. It doesn’t stop your need to comfort your mother when she is feeling overwhelmed and alone. It doesn’t stop you from wanting to eat nothing but her chicken soup when you are sick from some unknown foodborne illness. This kind of life doesn’t stop you from wishing you were more a part of your friends’ lives or worrying that they will forget about you. This isn’t an escape from your life; you take who you are and who you were with you. You want the people you love to care about what you are doing - you want them to follow your posts, check your weekly route progress, read your blog (I just laughed out loud when i wrote that), you want them to think its exciting and cool even if they think you are out of your mind for doing it. First, we plan a lot less far in advance. We are learning to LIVE IN THE PRESENT. There is no room for anything else. We never know what is coming ahead – we don’t know what road or weather conditions may be on our next day’s route. We don’t know if we will like a place or hate it. Generally, we can’t plan more than two days in advance. Sometimes, even that is a stretch. We have to TAKE EACH DAY AS IT COMES. It is so different than our previous lives. Before, we had schedules planned weeks in advance, filled with meetings, deadlines and projects, vacations booked months ahead, dinner reservations and Sunday fundays. Now, we really take in every moment because it’s the only moment we have for certain. There is no looking ahead to what’s next because we have no idea what’s next. There is very little looking back because we are figuring things out and taking in what’s going on in the present. This trip has taught us to soak in things we would only have taken brief note of before – colors, skies, smells, people we meet. We have learned to FOCUS ON NOW, on what’s right in front of us. I have found myself listening to what people say to me in a way I was never good at before, studying their expressions and mannerisms, hearing the tone of their voice. This change came about from basic attempts at communication. Being present and in the moment with someone is your only option when you don’t speak the same language but need to convey something important. Second, we PAY ATTENTION TO THE ELEMENTS Never before have wind, water and sunlight played such a role in the ongoings of my day. We live in a tent on top of our car. There is no real shelter or living space. If it’s too windy, our stove has trouble lighting. We have to make sure we have enough fresh purified water every day to drink, cook, wash our hands, keep our dog hydrated. We wake up with the sunrise and fall asleep when its dark. We have started to smell rain hours before it begins and notice how altitude can affect our moods. Third, We are learning that LESS IS REALLY MORE. I repeat, we live out of a car. Our Landcruiser has very limited space, especially with a portable refrigerator and large dog sharing the small bit of room that we have. When we pulled out of our driveway in Nashville, things we thought we needed for daily survival were tucked into every crevice. You couldn’t open a door without items falling out. It was miserable. Now, we find relief and freedom in anything we can get rid of. We have slimmed down our belongings by at least 50% since we left. And every purge makes us happier. THE ESSENTIALS ARE ALL WE HAVE AND ALL WE NEED. Sometimes, we go into cities with intentions of buying all kinds of things that we can’t get out on the road – and leave those cities empty handed because buying things just doesn’t hold the same thrill it once did. There is just so little we actually need. Our current daily needs include figuring out where we will camp, preferably with clean bathrooms and a hot shower, making sure we have enough food and water for that day, finding gas stations, generally trying to land in a place with either phone service or wifi, setting up camp, sleeping, taking down camp, moving on to the next place. The less we have, the easier all of this becomes and the happier we are. Fourth, we APPRECIATE DIFFERENT THINGS THAN WE USED TO – simpler things that were once taken for granted and now, are gifts from the universe, worthy of the little happy dance that comes when we have them. HOT SHOWERS. CLEAN CLOTHES. GOOD CHEESE. BATHROOMS WITH TOILET SEATS. ICE. And the holy grail – real CREAM FOR OUR MORNING COFFEE. These are the things that get our clocks ticking. We have learned to REALLY TRUST EACH OTHER. I have gained so much information about how capable Karin is as a person, as a partner and in life. She can figure anything out. Her optimism when I was panicking about some little thing gone wrong used to wear me out. Now, I’ve seen her literally, figure out ANYTHING, and it gives me tremendous security. 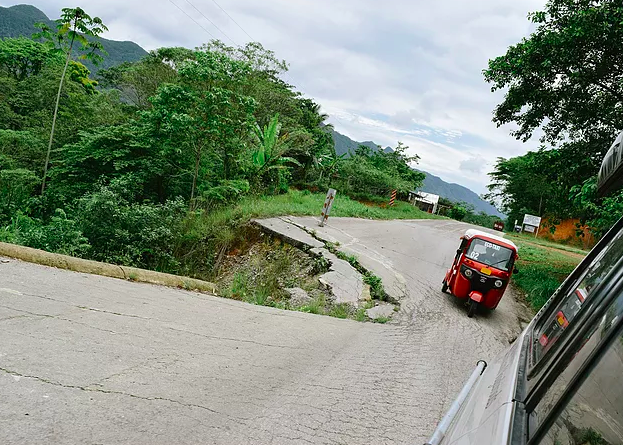 These Mexican roads, when there are actual roads, are often treacherous – filled with giant holes, invisible speed bumps, mile long drop offs, donkeys, dogs, you name it. Karin is a GREAT driver, exceptionally qualified for a journey like this. She has kept us safe and I have come to accept that as simply the way it is. If its drivable, she can drive it. She is brilliant and courageous in ways I never saw coming. For example, I never would have guessed she would be so….okay staying in Mexico City by herself for a week when I had to go home for a family emergency. Not only was she okay but she also thrived, making the city and the experience her own. We are learning to GIVE EACH OTHER SPACE, AND QUIET when one of us senses the other needs it. Its not an easy thing to learn to notice or to give without condition or subtext but I’ve come to believe in the power of giving another person what they need, before they have to ask for it but especially if they do. People told me that this type of trip, being with each other 24/7 for months at a time would make or break us. It has only made us stronger. I love her and see her in a completely different way. I can’t speak for her but I have felt her love and respect for me grow as well. Finally, we have learned to TRUST OURSELVES. I know now that we can handle any situation that may arise. Stuck deep in the sand on a deserted beach in Mexico with no other people for miles? No problem! We planned for this – we have the gear we need to get out. Lost in the mountains without working GPS or phone signal? No problem! We have a paper map, a compass, big smiles and an ability to talk to locals in a way that makes them want to help. Policia trying to shake you down for cash on the side of the road with a bogus claim that your dog is supposed to be in a cage while riding in your vehicle? No sweat! We know how to be the right amounts of firm and polite in letting them know we won’t be messed with. We are CAPABLE. I don’t think these changes in our daily routines and perspectives will be lost upon our return to a more regular life. I don’t think I will ever forget how much happier simplicity and presentness have made me. I also don’t think I will take for granted again the things from home that I miss the most – the sound of my mother’s laughter, meeting with friends for drinks and hearing the stories from their daily lives, easily accessible organic markets, bookstores, walls, electricity, clean water, juice bars (this one really gets me).